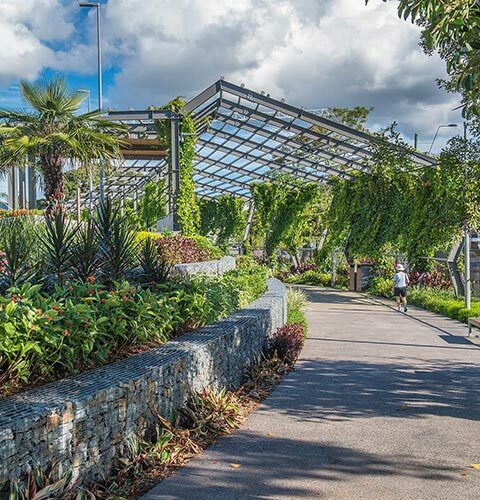 The redevelopment of Munro Martin Parklands is a significant improvement to the cultural opportunities for the citizens of Cairns and the many visitors to the city. 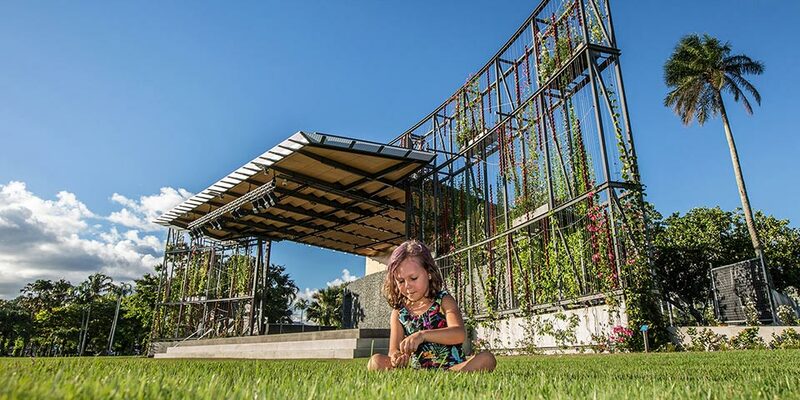 An exciting addition to the Cairns Performing Arts Centre suitable for a wide range of events from high profile performances to picnics and quiet visits to the park. 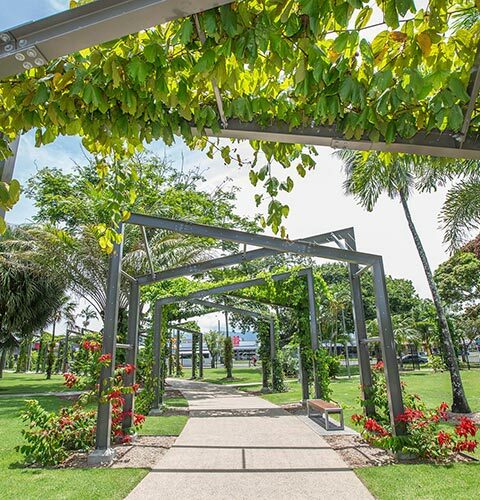 Through innovative and inspiring design, the Munro Martin Park redevelopment has transformed this important public open space in the Cairns CBD into an effective, vibrant public amenity and unique open air performing arts venue which will be a key attractor in Cairns for the foreseeable future. 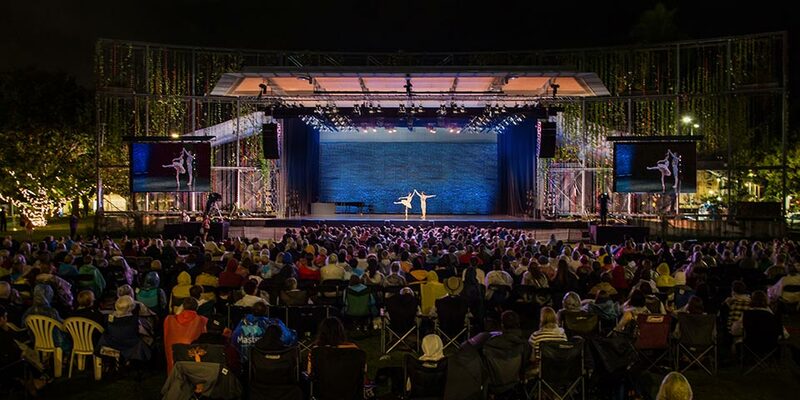 The resulting design has created what is sure to become a nationally renowned symbiosis of flamboyant botanical displays and unique outdoor performance venue. 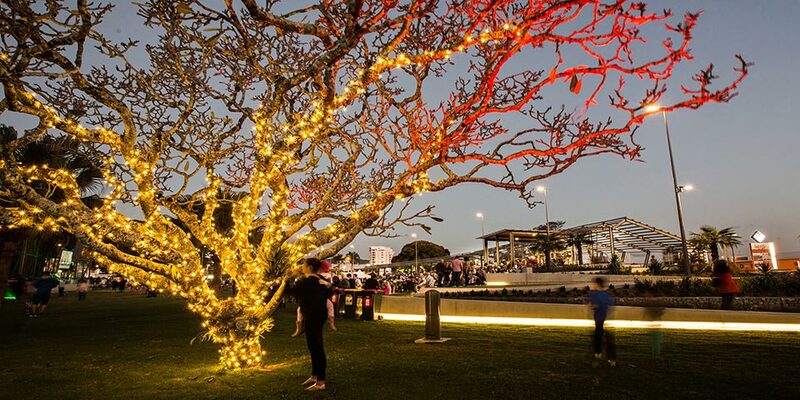 By using impressive structural arbours covered in colourful vines, CA Architects and Prowse Landscape Architects have given the space definition – responding to the residential properties and main road and addressing the redeveloped Cairns Performing Arts Centre – and given locals and tourists a genuinely attractive destination. 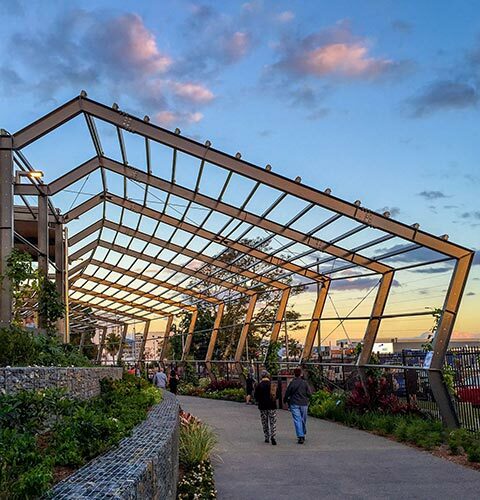 The heroes of the scene are the 70 arbour frames, providing the stage for 275 vines with supporting cast consisting of 63 new trees, and almost 7,000 smaller plants. 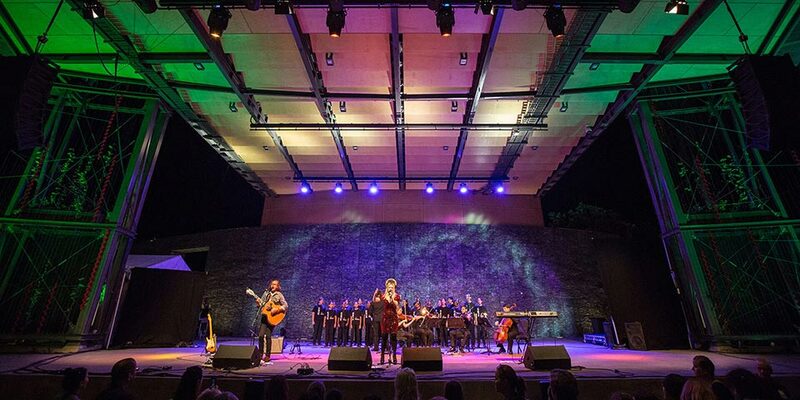 The stage which has been designed to accommodate an entire Symphony Orchestra, with the flexibility to host a variety of professional, amateur and community events is also furnished by the botanical actors with a 10m high trellis proscenium flourishing with the radiant colours of the Mandevillea vine and a backdrop created from local rock in the form of a 6m tall curved gabion wall. 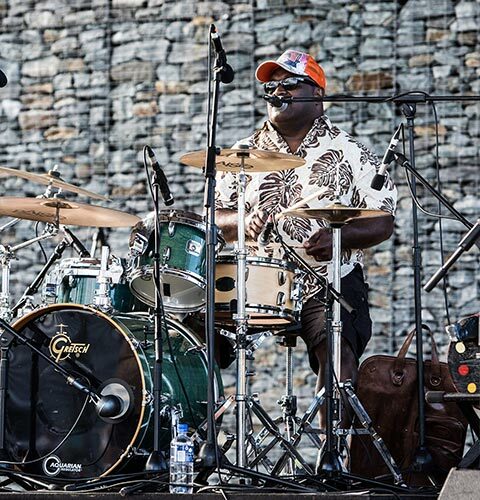 With carefully placed fencing and landscaped tiers the space becomes an economically sustainable ticketed performance venue. 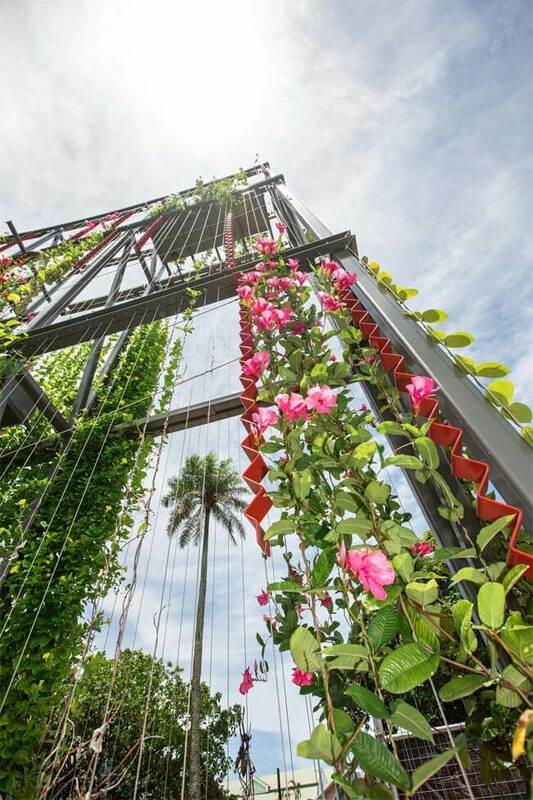 The courageous approach of embedding the design in vibrant tropical colours and foliage, working with the element of time, and further enhanced by commissioned artwork which responds directly to the local topography, firmly roots the project in the place in a way which cannot be reproduced anywhere else in the world.